For each semester of Science Fiction, students are required to read one text of their choosing independently. Criteria for choosing a text: Your text should be a novel or collection of short stories falling into the genres of Science Fiction or Fantasy. 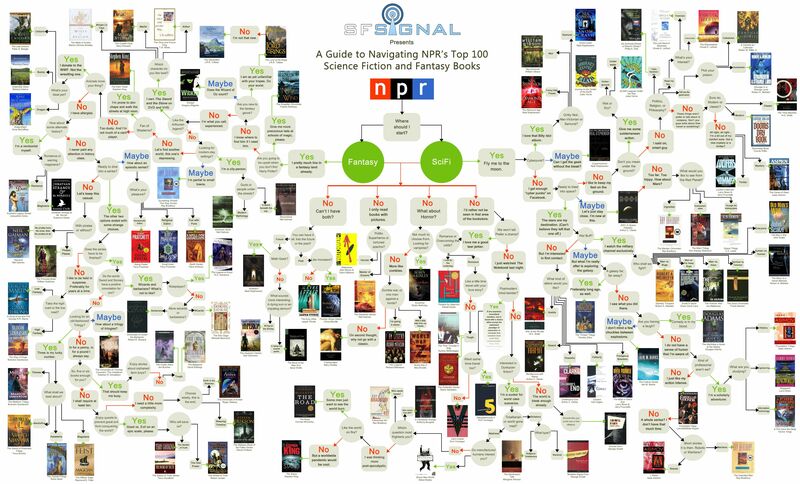 Check out NPR’s handy flowchart guide to SF and Fantasy! It has all kinds of ideas to help you select the right book for you. Or choose a Hugo Award winning novel from the list of all the novels selected since the award was first given in 1953. At the end of the semester, you will analyze your reading in a piece of critical writing. Use Mrs. Edelen’s SF Critique and Discussion standards for stories and novels to guide your thinking (replace “Sci-Fi” with “Fantasy” as needed). Detailed Critique, including introduction of the plot and characters, analysis of themes. See Critique Standards. Include a “rating” (Two thumbs up, 3/5 stars, etc.) as your thesis, and support your reasoning for the rating. SEMESTER 2: At the end of the semester, you will present a place setting that is representative of your reading. See the assignment sheet here.